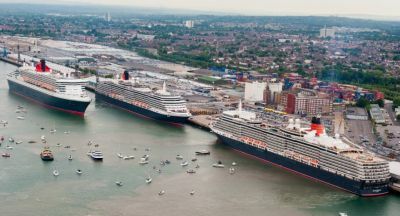 Ship enthusiasts and those just fancying a historical day out should note that next Friday 9 May, RMS Queen Mary 2, Queen Elizabeth and Queen Victoria will all be at Southampton replicating the Diamond Jubilee celebrations. HRH Prince Philip will help celebrate QM2’s ten years of service joining a special lunch to honour the occasion. This month’s Business Travel News visits the river cruise market, with an outline on the current scene, a review of the brand new Emerald Sky, and also a listing of some current offers. The ever-growing appeal of river cruising has led to a significant rise in the number of UK passengers taking a holiday on Europe’s waterways, with 2013 seeing a jump of 22% according to figures released by CLIA UK & Ireland, the trade body. River cruising on the Continent has an appeal for those who do not want a long flight, or would prefer to join their ship by rail or even road. Canal and river limitations mean that the maximum vessel size is around 200 passengers, and the rivers themselves offer very smooth travel with no chance of sea sickness. The so-called ports are usually no more than tow path tie-up points, but these can be right in the middle of a city. Emerald Sky, for her inaugural, berthed alongside Cologne’s Am Leystapel promenade (and just by the Chocolate Museum (See ON TOUR). Getting off was just a few steps on a gangplank. Around 110,000 Brits chose a river cruise holiday on the continent in 2013 plus 20,000 on the previous year. Europe now accounts for 83% of river cruises by UK passengers compared to 50% in 2009. The numbers have increased dramatically in recent times with the Rhine and Danube easily the favourites. The growth on Europe’s rivers was underpinned by a significant increase in the delivery of new cruise ships. Twenty-seven ships were introduced in 2012-3 and more are on the way. The 260 river cruise ships currently sailing the European waterways will be supplemented by a further 24 presently on order – an increase of 12%. The Rhine, Danube and Moselle rivers and their tributaries are the most popular accounting for 52% of all UK passengers in 2013. However, other rivers are growing even faster with the Rhône and Seine seeing 38% more passengers in 2013 and the River Elbe leaping by 50% over the same period. 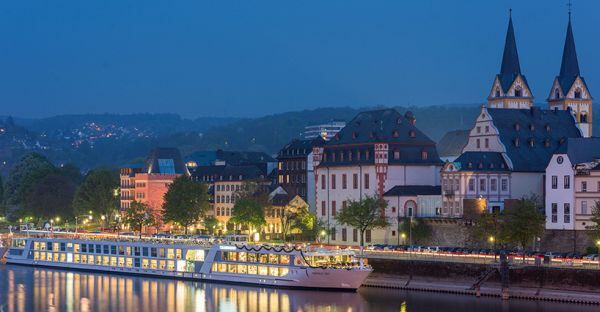 A key reason for the growing popularity of river cruising is the transformation of the holiday experience with new larger ships with greater amenities. A third of European river cruise ships have been built within the last 10 years – a quarter within the last five. These are larger and offer the kind of multiple dining venues, spa facilities and range of cabins with balconies which have already combined to transform the experience offered on many ocean cruise ships. There is a new kid on the block with European river cruising, Emerald Waterways. But don’t think that someone has looked at the market and is coming in without experience. Emerald Waterways is a new division of the highly successful Australian-based Scenic Tours (also know as Evergreen ‘down under’) founded by husband and wife team Glen and Karen Moroney 25 years ago and established in the UK 10 years back by Chris Townson, formerly Managing Director of travel operator Tradewinds. Scenic Tours is a premium package at the very top end of the market with just about everything included. They are the only river cruise company to offer a personal butler, and plus a choice of dining experiences, not usually found on river ships. Since Scenic Sapphire, the line's first purpose-built riverboat, was launched in 2008, eight other 169-passenger, Europe-based ships, all with 84 outside cabins, have debuted (or will debut this year). These are Scenic Gem, Scenic Jewel, Scenic Crystal, Scenic Pearl, Scenic Diamond, Scenic Ruby, Scenic Jade and Scenic Emerald. One additional ship, smaller than the rest of the fleet, is the Russia-based Scenic Tsar, debuted in 2012. This ship, with only 112 passengers, is not part of the "space ship" series of vessels but was significantly updated and refurbished before its launch. Enough of Scenic. Another time perhaps. 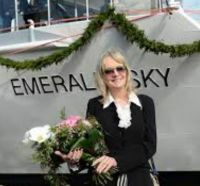 We will concentrate on Emerald which now sits in the market rather like Cunard does for Carnival Corporation with regards to Seabourn, that is a quality product in itself but with some of the bells and whistles missing. European river ship designers are constrained by the length and width of the locks they have to negotiate, effectively limiting them all to 135m length and 11.4m width. But it is amazing how designers are able to make each series of ships individual whether it be the hull design (Emerald Sky is said to be extremely efficient as it ploughs through the waters at 7 knots) through to the cabin layout. ‘Sky’ has a mirror-walled 24-foot high atrium extending over three floors and a surfeit of windows makes for a very bright interior and in the cabins a new design replaces the French balcony, affording in the two upper decks suites with vertical sliding windows and an interior decked balcony, and others full-size balconies. Clever use of mirrors, particularly in the cabins, makes everything seem bigger than it actually is. Furnishings are contemporary and cabins and public areas are suffused with light. The bed mattresses are perhaps over generous in width and one has to shimmy sideways along one side of the bed to access the bathroom. Make them slightly smaller for the next ship! On board is an interactive TV system which not only gives you a selection of stations but a route map (a variant of Google Earth is promised). Very large screens are placed in selected points around the ship. During the port lectures you can see the presentation from virtually anywhere. Also available is hotelpress.net, a four page printed news review available as a financial edition, UK-European, USA-Canada and naturally an Australian version too. Breakfast and lunch are both buffet style, but with a cooking station for eggs and special dishes. Dinner more or less at a fixed time, usually 19:00, perhaps a little early for Brits but ideal with North Americans and Oz customers. The maiden voyage was also a shakedown trip and a few minor deficiencies were noted, with the most important one the swimming pool steps. They only went down a couple of rungs into the water, OK for six foot plus Australians but hopeless for your Editor. This is being modified and Emerald Star is being delivered with the correct steps. The cabins have the usual single beds capable of acting as a double but the side tables were fixed and unable to be transferred into the centre in order to make the cabin a twin. This too is being sorted. Supermodel and Broadway star Twiggy was the Godmother of the ship and broke the Champagne bottle with real aggression. She and husband Leigh Lawson stayed on for the whole trip and found time for a hilarious informal media briefing. She recalled a trip down the Moselle in her halcyon teenage modelling days. Making a splash in the world of river cruising doesn’t require discovering a new river or creating a new route; it calls for innovation in ship design. And Emerald Waterways has come up with a gem: a heated swimming pool, surrounded by loungers, with its own bar, gelati station and, above all – in every sense of the word – a retractable roof, making this an inviting oasis whatever the weather. Even more imaginatively, retractable flooring and a giant, drop-down screen can transform this entire area into a cinema for evening entertainment complete with popcorn and ice cream. The sound quality is outstanding. 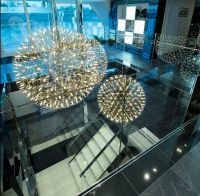 New thinking extends into eating and drinking areas as well, with an open-air Terrace at the bow, for al fresco dining, and a pop-up Sky Bar on the Sun Deck. 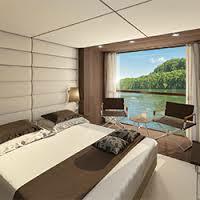 A European river cruise is really a touring holiday where you take your hotel with you. 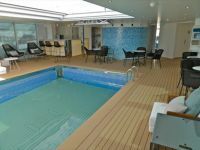 The facilities available on sea-going ships are for the most part not on offer, nor is river cruising suitable for younger children, or people with less mobility. The holidays are mostly ‘total pacakges’ which includes travel to and from the ship, dining, service and some off ship tours. Prices shown are per person.